Ten Long Island state parks will have new, uniquely themed playgrounds which will be opened next spring! Ten Long Island state parks will be sharing $1.35 million from Gov. Cuomo’s New York Works initiative. The money will be used by The New York State Department of Parks, Recreation and Historic Preservation to build and improve playgrounds. Eight of the ten designated parks will have playground renovations centered around unique themes. Belmont Lake State Park in North Babylon will feature a “bug” theme, with the addition of a dragonfly seesaw and butterfly climbing structure. Bethpage State Park will adopt a “woodland nature” theme for its playground and picnic area, with new ladybug, bee and mushroom climbing structures. The “wildlife” themed renovations at Heckscher State Park’s playground in East Islip will feature the park’s native deer, fox and osprey. Hempstead State Park will be transformed into carousel-themed playground with benches arranged in a circle around, mimicking the arrangement of the park’s actual functioning carousel. Hither Hills will get a touch up with it’s new “sea and sand” theme, including a dolphin spring ride and sea creature inlays in the rubberized surface coating. At Montauk Point State Park, young patrons will enjoy a new ship’s bow feature and functional telescope. A “maritime” theme will be applied to the playground at Orient Beach, and a new seahorse spring ride and sailboat sandbox will be added. Valley Stream State Park will be renovated with a “stream” theme, with colorful blue and green installations including turtle-shaped climbing features and spring rides. The two other parks, Brentwood and Sunken Meadow, will have new playgrounds installed to feature a “soccer” theme and “animal habitats” theme respectively. 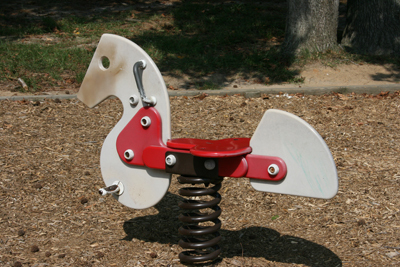 Sunken Meadows’ new playground will be complete with a bird’s nest and hollow log play features, which are to be installed near the Field 4 picnic tables. In all, the state has plans to renovate or build 50 parks throughout the state, targeting parks with high family visitation. The new playgrounds are expected to be ready by next spring. Funding from the New York Works initiative is creating 20 new additional or improved playgrounds in 2014. Subject: LongIsland.com - Your Name sent you Article details of "New Playgrounds Planned for 10 LI State Parks"